Naomi Maxine (Cotter) Welty was born on May 13, 1935 in Freedom, Oklahoma to Bruce and Ethel Iris (Romig) Cotter. She grew up in Farry, Oklahoma and attended the Farry Schools, graduating with the class of 1953. Naomi was united in marriage to Sam Welty on May 8, 1953 in Alva, Oklahoma. To this union two children were born, John and Jonette. They later made their home in Shattuck. 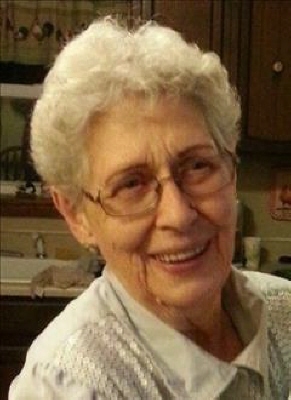 She worked as a mail carrier and a Nurse Aide at Newman Memorial Hospital. Naomi also worked at Duckwalls which later became Alco, and she milked and fed cows, drove tractor and feed truck. Naomi served as president for the Sorosis Club for many years. She loved feeding and watching her birds, but most of all she loved being with her family, her dog Frisky and any baby animal. She is survived by her son John Welty of Shattuck; daughter Jonette Shuja and husband Jalal of Wichita, Kansas; grandchildren, Justin Welty and wife Billie of St. Clairsville, Ohio, Lori Davis and husband Jim of Collinsville, Oklahoma, Rabiah Awan and husband Kashif of Naperville, Illinois, Yaseen and Ibraheem Shuja of Wichita, Kansas; great-grandchildren, Spencer Brewer, Zakk Davis, Tommy and Trinity Moore, and Anthony Moore, Jahanzeb and Sufiyah Awan; two great-great-granddaughters; other relatives and friends. To send flowers or a remembrance gift to the family of Naomi Maxine Welty, please visit our Tribute Store. "Email Address" would like to share the life celebration of Naomi Maxine Welty. Click on the "link" to go to share a favorite memory or leave a condolence message for the family.